Our classes and levels are determined by the level of experience needed for each class, not the level of challenge. Try our challenging beginners Pilates Reformer Classes. Don’t be fooled by the name ‘Basic“, please be prepared to work hard. Basic Reformer is not an easy, nor an orientation class, but one that will teach you a solid base, which is key to a faster progression. Learn our basic principles and the beginner Pilates reformer exercises. Note: This class is completely different from the ‘Dynamic Reformer – Boot Camp‘ style classes. This is rather a classical Pilates based class that incorporates contemporary sports science and rehabilitation principles. Therefore, regardless how advanced in “dynamic style” reformer you are, we strongly recommend that you join an Basic Reformer first. This class will give you a strong base so that you can progress to the more complicated, more choreographed intermediate exercises. We will cover the basic principles more in depth and teach you preparations for the more advanced exercises of the classical repertoire. you are unfamiliar with exercises like the “One Hundred, Short Spine, The Elephant, Stomach Massage, Long stretch, etc”. You might want to book this class first as the intermediate classes will not be teaching these basic exercises. you have never done Pilates exercise before, its been a long time, or you do not know the basic classical Pilates repertoire. you have only done dynamic Pilates before (no matter how advanced or how many years you’ve been practicing “boot camp” style dynamic Pilates). You will need to learn the proper classical exercises before you progress to the intermediate classical level. you are not familiar with the classical STOTT PILATES® essential repertoire and method. See our Five basic principles. Learn the intermediate repertoire in this class. Standard Reformer is basically an intermediate level class that allows for stops and starts to teach you the more complex intermediate exercises. Thereby, when you get to level 3 – Intermediate, you don’t have to stop to learn them, but rather beautifully flow through the repertoire like a dance without stopping.Introduce yourself to more complex movement sequencing requiring greater control, while bridging the levels 1-3. Flow through the already familiar essential level exercises and put behind the exercise beginner preparations. This class is recommended if you have been attending our Basic Reformer Pilates classes for a while and you are ready to learn the intermediate exercises. You must be already familiar with our basic principles and exercises before you sign up for this class as we will not be able to stop and teach the basics. You will also need to be able to set up our reformer settings, as shown in our Basic classes. This class will give you a strong base so that you can progress to the more complicated, more choreographed intermediate exercises. We will cover the basic principles more in depth and teach you the preparations for the more advanced exercises of the classical repertoire. Get to know the basic repertoire and principles before you sign up for the intermediate level classes. Please note that this class is completely different from Dynamic Reformer classes. This is a classical Pilates based class. No matter how advanced in “dynamic style” reformer you are, we strongly recommend that you join an Essential class first. Therefore, you can become familiar with the unique classical Pilates repertoire and technique. We will not be able to stop to teach the intermediate exercises in this class, as we assume you already have learned these exercises in level 2. Rather we will flow beautifully through the intermediate repertoire so that clients can be challenged at a true intermediate level.Level 3 exercises require class participants to be familiar with the repertoire, posses greater control of your body, coordination, strength, flexibility and endurance.Recommended for clients with fair command of the intermediate classical repertoire and a solid foundation on the basics found in the Basic and Standard level classes. Our intermediate Pilates classes are classically based. Class participants are expected to posses a solid foundation in the basic technique. This class will flow at a faster pace through the classical intermediate exercises and the instructor will not be able to stop to teach Level 1, & Level 2 exercises or technique. Please note that while some participants may be quite advanced at “bootcamp style” Dynamic Pilates, this classically based class is completely different. Therefore, we strongly recommend that you are fully familiar with intermediate classical Pilates exercises and our technique before signing into this class. We expect participants to possess a solid foundation of the STOTT PILATES® Five basic principles before signing up for the intermediate level classes. At a true advanced level, class participants are expected to posses full command of the intermediate classical repertoire and its transitions to avoid feeling left behind in class and possibly risk injury. Joseph Pilates created the advanced workout for athletes, dancers and gymnasts, not interval-training, circuit-training style enthusiasts. 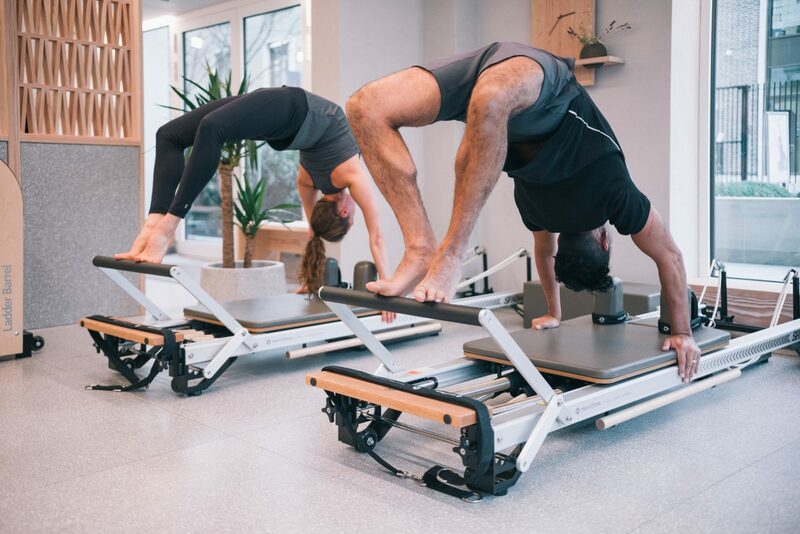 Advanced reformer is for those men and women enthusiasts with a minimum of 20 intermediate Pilates reformer classes under their belts and ready for more challenging advanced, complicated, extreme classical reformer exercises, whilst also perfecting their Pilates technique. During this class our instructors will not stop to teach any of the the intermediate repertoire in this class. Instead, we will teach the advanced repertoire. Consequently, we will endeavour to cater to the most advanced client in the room. In short, we strongly recommend that class participants are fully familiar with the classical intermediate repertoire. Note: This class is Not appropriate for individuals recovering from surgeries or injuries. If you suffer from any injuries we kindly request that you contact us before signing in to this class and we can advise if you are permitted to join. Most exercises will go into full and end range spinal movements, shoulder movements and very few modifications will be given in order to keep the flow of the advanced repertoire. Our instructors will lead you through a complete athletic body workout. Advanced reformer exercises that will challenge the most advanced male or female client. This reformer class is designed for those women who have been cleared for Pilates exercise from their GP. We will take carefully through safe exercises that help reconnect the core musculature without jeopardising your ligaments, especially during the breastfeeding months. The goal here is to build up your strength from the inside out, retraining your deep stabilising muscles, pelvic floor and working our way up to your previous or better strength. Pilates exercise offers an excellent way to return to exercise. Pilates exercise focuses is on strengthening your body SAFELY. The emphasis in Pilates is on core stability and peripheral mobility. Connect back with your pelvic floor muscles. Reconnect the deep abdominal muscles in order to help you to return to a more stable limbo-pelvic region. This class is designed for those who have just been cleared for Pilates exercise from their GP. We will take carefully through safe exercises that help reconnect the core musculature without jeopardising your ligaments, especially during the breastfeeding months. The goal here is to build up your strength from the inside out, retraining your deep stabilising muscles, pelvic floor and working our way up to your previous or better strength. Pilates exercise offers an excellent way to return to exercise. Post-natal Pilates reformer classes focus is on strengthening your body SAFELY. The emphasis in Pilates is on core stability and peripheral mobility. Connect back with your pelvic floor muscles. Reconnect the deep abdominal muscles to help you to return to a more stable limbo-pelvic region. Our Prenatal Pilates Reformer Classes are designed for pregnant women 20 weeks and over, time at which we will not be able to accept pregnant participants in our regular classes. If you are clear by your GP for exercise, we welcome you into this class. Stay in shape and exercise safely during your pregnancy. We add many modifications to help you stay safe. We keep shorter levers, take breaks more often, and keep your exertion levels manageable whilst providing you with a great workout while you’re pregnant. Our aim is to help you maintain and improve core strength during your pregnancy, which may help reduce lower back pain, maintain and improve pelvic floor tone. Strengthen your arms, gluteus and shoulders, which are paramount after delivery while breastfeeding and carrying your baby for long periods of time. Cardio Tramp class is for the endorphin addicted. This is a Level 3 – Intermediate Level high-intensity interval training class on a trampoline that attaches to the reformer. Allowing for hundreds of high-intensity exercises, the Cardio Tramp facilitates you to work your body targeting your big power producing muscles. Work your legs, seat muscles, shoulders, arms and more with amplifying intensity. It is not a classical reformer class, but rather an athletic conditioning class on the reformer rebounder, a completely different experience. Be kind to your spine. Our back care class is a flexion free class. This means that we will work in your individual neutral spinal alignment without bending your lower back. Perfect for those people recovering from spinal injuries such as disc or facet problems, back surgeries, arthritis, osteoporosis, or any conditions that might prevent you to apply excessive loads to your spine. Increase your spinal stability on the reformer and build strength by incorporating mobility to the upper back, shoulder girdle, ankles, hips and build a strong solid base. Back care Pilates reformer classes are ideal for our active ageing clients. Your instructor will provide adaptations for issues such as low bone density, wrist problems, knee and hip restrictions and if needed, slower transitions from one exercise to the next. We offer personal training sessions for teens. From time to time, Pilates reformer classes for teen class are scheduled. These are offered on seasonal basis and only on demand. £15 if its your first! For after-hours training we will strive to accommodate any request. Only up to 5 participants per equipment class with top of the line STOTT PILATES® reformers. Rolling contracts are available online. PILATES® instructors who can deliver true Pilates with sound fitness results. GIFT CERTIFICATES AVAILABLE 5% off any product when you purchase for someone else.